Squirrels are an expensive nuisance at a backyard bird feeder and they can be difficult to outwit because of their flexibility and adaptability. Droll Yankees offers a few tips and product suggestions that allow backyard birders to avoid any squirrel proof woes. The Yankees Flipper sends a squirrel on a wild ride away from the feeder. Because they are social creatures and live in family groups, squirrels have the ability to share knowledge among themselves. Squirrels are considered a hindrance to backyard bird feeding. They are responsible for chasing birds away and destroying feeders. It can be costly to buy seed for feeders to compensate for their appetites as well. 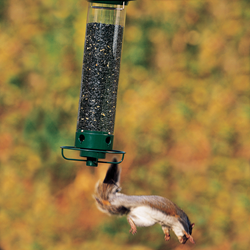 Squirrels can finish the contents of a feeder in no time. Droll Yankees has a list of suggestions to effectively squirrel proof feeding stations and keep seed for backyard bird enjoyment. Squirrels are acrobatic and have impressive jumping capabilities. This creates a challenge when trying to keep things out of reach. Squirrels will try all available angles to access food sources. According to a National Wildlife Federation article, entitled "Thwarting Backyard Squirrels", a squirrel can rotate its hind feet 180 degrees. This ability makes a squirrel dexterous and adaptable to climbing situations. The key rule to remember is feeders and feeding stations must be placed at least 4 feet above the ground and 8 feet from any points from which squirrels can leap. It is also wise to trim back and prune nearby bushes or branches within 12 feet of a feeder. This rule is the essential basis for squirrel proofing a feeding area. Whether a feeder is pole mounted or hung, there are options that will aid in deterring squirrels attempting to access seed. Squirrel baffles come in various sizes and styles that address different mounting needs. Droll Yankees offers a variety of squirrel baffles that hang or pole mount to accommodate all feeding situations. When picking a hanging squirrel baffle, birders need to find a wide dome that will block squirrels’ ability to reach around the dome and grab at seed in the feeder. Hanging baffles that tilt and shift with the movement of squirrels will cause their paws to slide off the dome. The smooth surface of the dome prevents squirrels from gaining traction. Droll Yankees offers two models of hanging squirrel baffles. For pole mounted squirrel baffles, secure and proper placement is key. A pole mounted squirrel baffle will prevent squirrels from climbing up a pole to access the feeder. Some popular styles of pole mounted baffles include domes, angled cone shapes, and long tubular stove pipe designs. The baffle must be large enough that squirrels can’t circumvent it. Droll Yankees offers a wide 15” diameter dome shaped, pole mounted baffle, as well as an 18” diameter pole mounted tray that squirrels cannot jump over or climb around when scaling the pole. Whichever squirrel baffle is employed, the feeder will be protected from pilfering squirrels that can’t maneuver around the barrier. Caged feeders are another effective squirrel proofing technique. These feeders are either purchased as a complete unit or created by adding retro fit cages around tubular bird feeders. The metal cages have openings sized to allow small songbirds in but keep squirrels and larger bully birds out. Purchasing a feeder with squirrel resistant features will save time and energy trying to find ways to outsmart squirrels. Choose products with sufficient distance between the cage and the food so that squirrels cannot reach in. There are feeder models on the market designed with additional squirrel blocking features. A popular and entertaining method of foiling feeder pests is Droll Yankees’ line of squirrel proof feeders called the Yankee Family. These four feeders have weight sensitive features, like a motorized spinning perch ring, collapsing perches, or a tilting seed tray, all designed to quickly displace squirrels from the feeders and discourage them from returning. Squirrels can be tough adversaries to beat. Tactics must be changed often because squirrels quickly catch on to these methods. Because they are social creatures and live in family groups, squirrels have the “ability to share knowledge among themselves,” according to University of Arizona biologist John Koprowski in the National Wildlife Federation article. Young squirrels are able to watch and learn from older generations how to foil squirrel proofing attempts and access seed. Some backyard birders choose to feed the squirrels separately and distract them with separate feeders and feeding areas instead. This means the birds and bird feeders are left undisturbed. Whatever option is chosen, always keep in mind the safety of the animals involved and don’t use any means that may harm the squirrels or your backyard birds accidentally. Never grease poles. Grease can mat squirrels’ fur or coat birds’ feathers and cause serious injury. By taking safe but effective steps, birders can reduce or eliminate squirrel presence at backyard bird feeders, making a happy habitat for everyone. Visit drollyankees.com to learn more about feeding birds and to purchase bird feeding products.